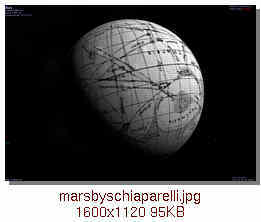 4: Mars as drawn by Giovanni Schiaparelli. 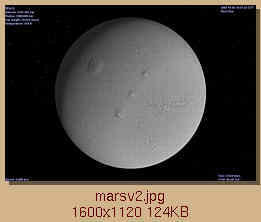 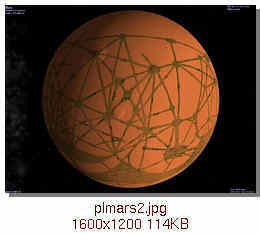 5: Mars as drawn by Percival Lowell. 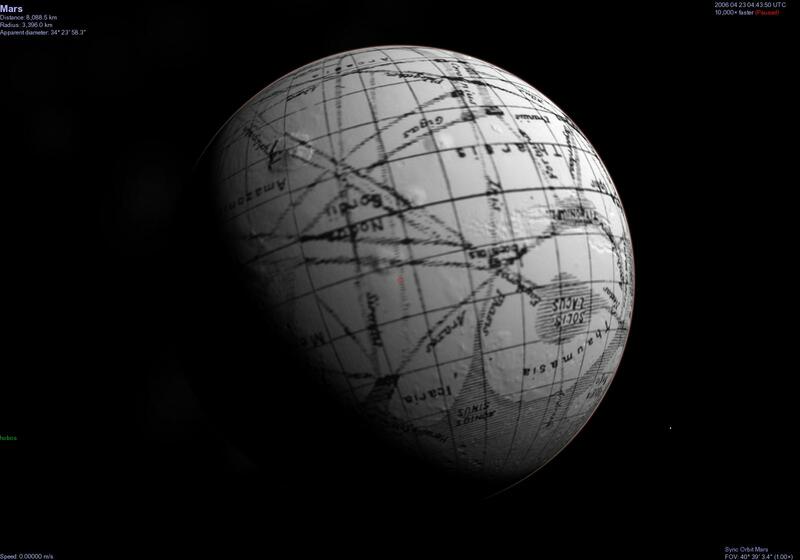 6: Mars as imagined by Percival Lowell. 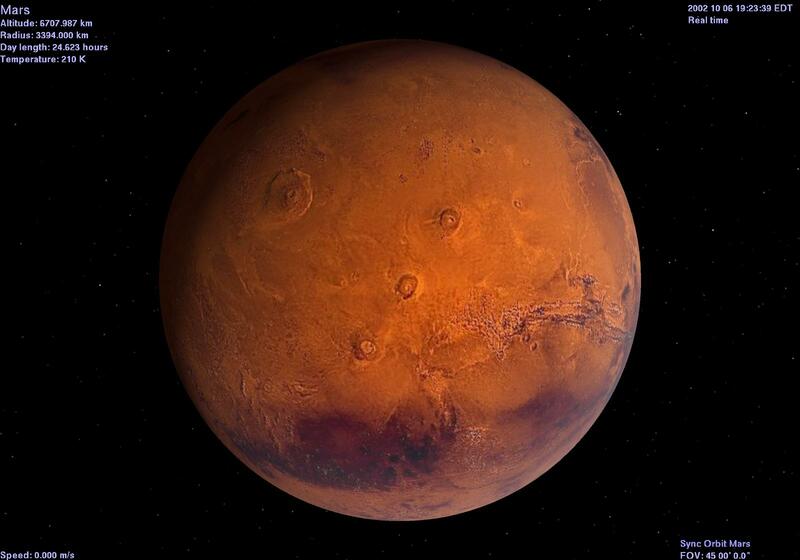 7: Mars as it is now. 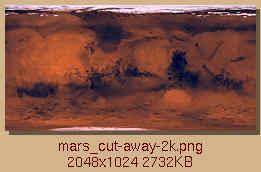 8: Mars: NASA MOLA maps. 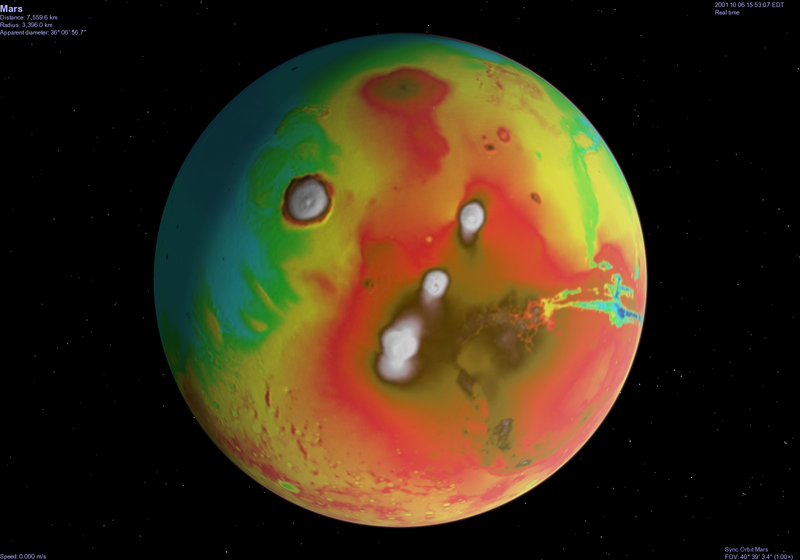 9: Mars: MGS-TES minerology maps. 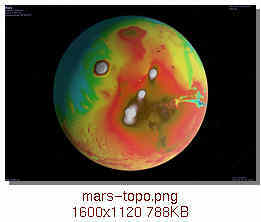 10: Martian maps from PDS. 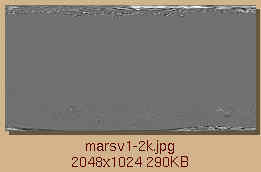 11: Using Alternate Surface Textures. 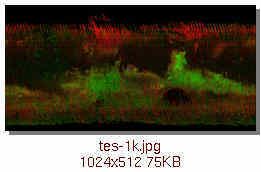 These surface textures are all relatively low resolution. 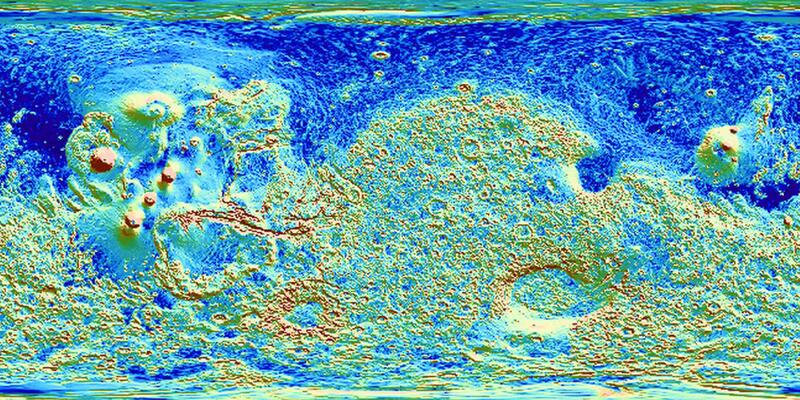 If you want high resolution, realistic bumpmaps and textures, visit Fridger Schrempp's Celestia Textures Foundry. 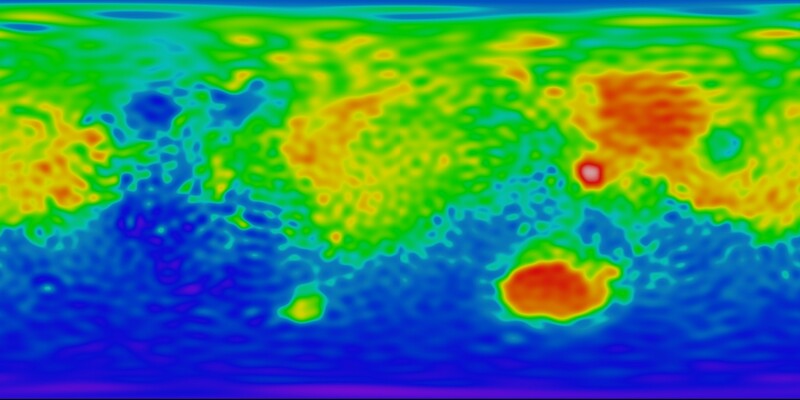 These maps all have 0 degrees of longitude in the center. They should be used with Celestia v1.2.5 or later. 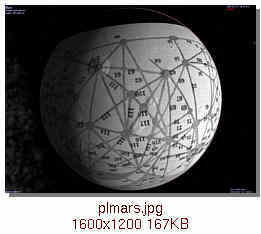 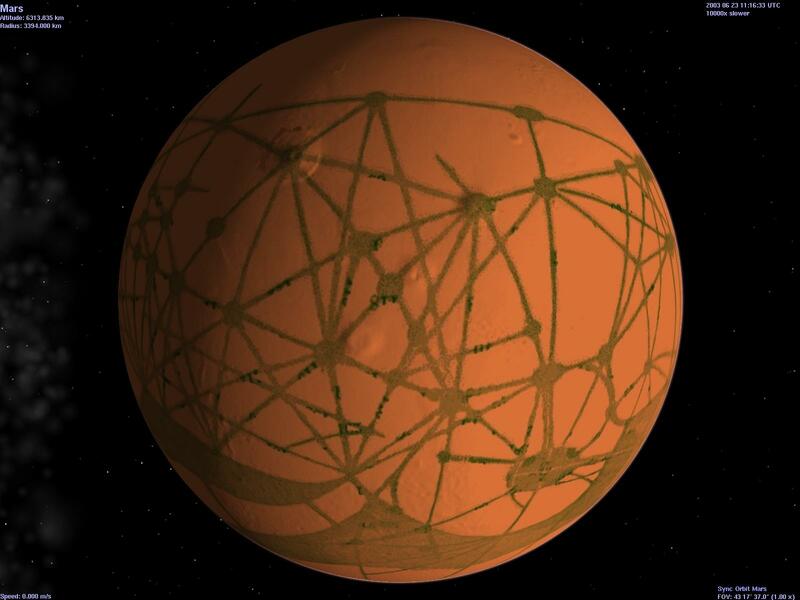 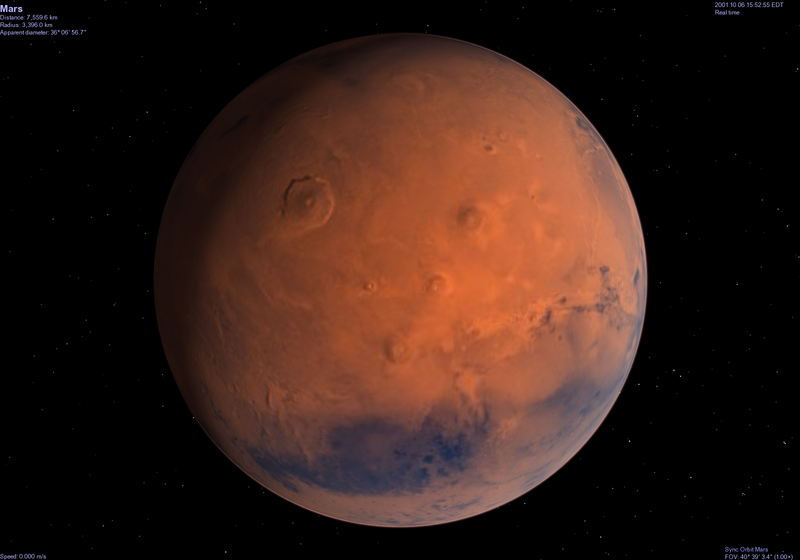 If they are used with older versions, Mars will be drawn with the wrong phase. 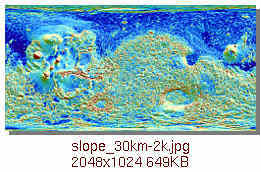 A corrected version of solarsys.ssc for the older versions of Celestia is available on the Web page http://www.lepp.cornell.edu/~seb/celestia/hutchison/index.html. 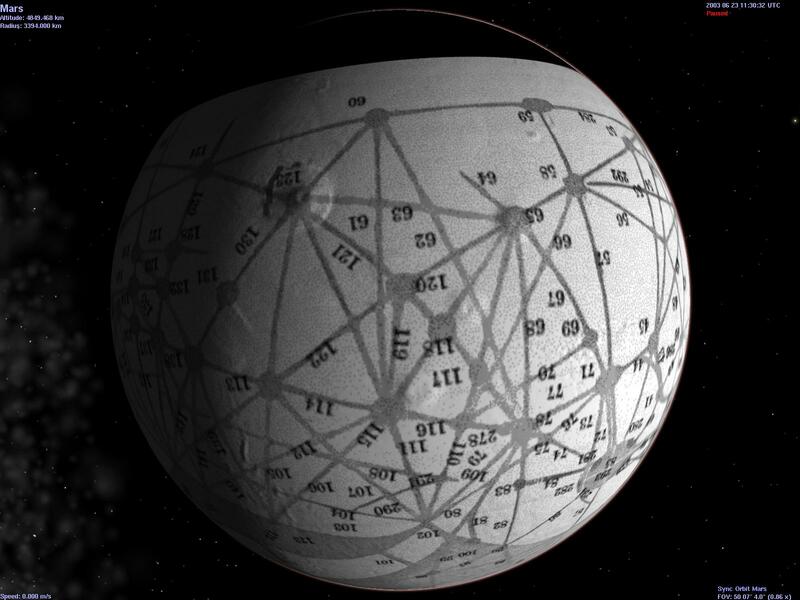 A corrected version of solarsys.ssc is included with Celestia version 1.2.5 and later. 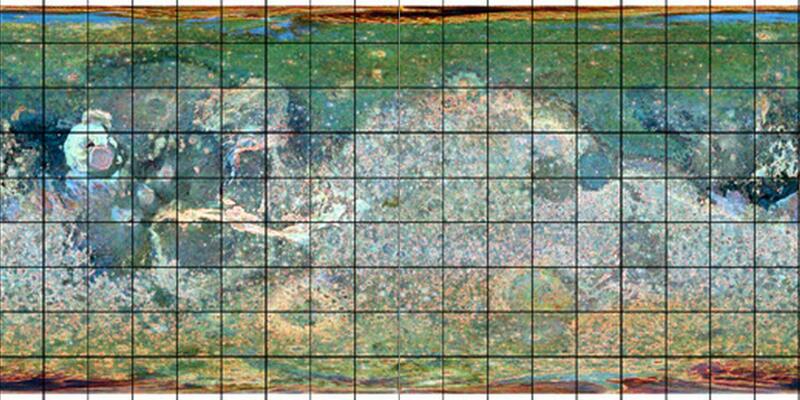 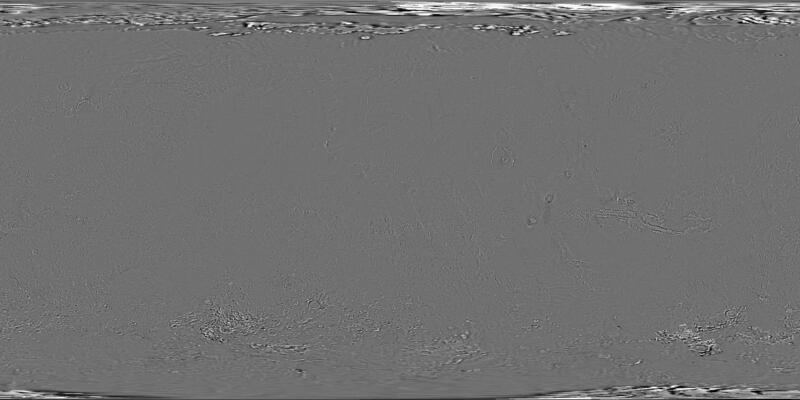 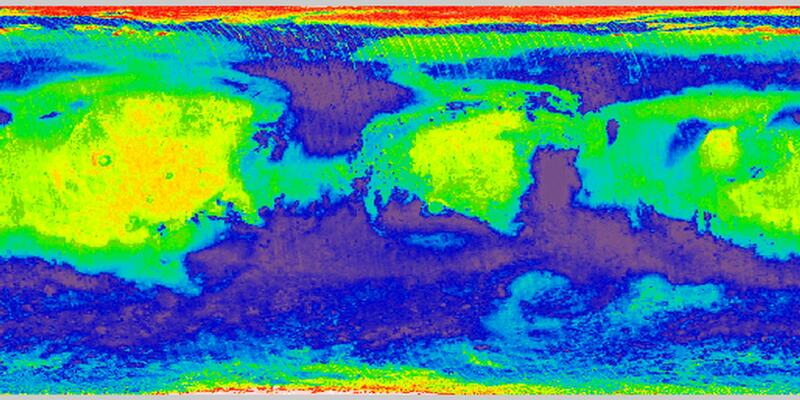 The "Percival Lowell" surface textures were updated to v3 on 22-Jun-2003. The alignment between the two original GIF images has been improved. 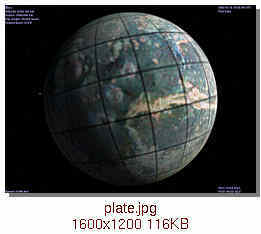 A crude conversion was made from Mercator to Plate Carree. 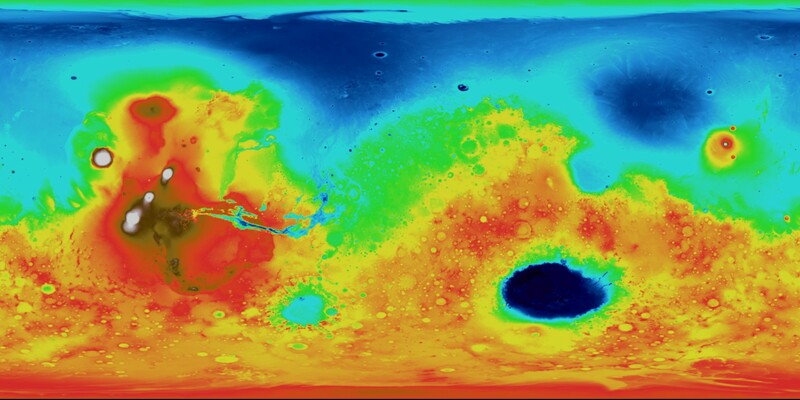 Each 10 degrees of latitude, as indicated by the marginal fiduciary marks, was linearly scaled to be the same size as the interval between 50 and 60 degrees south latitude. 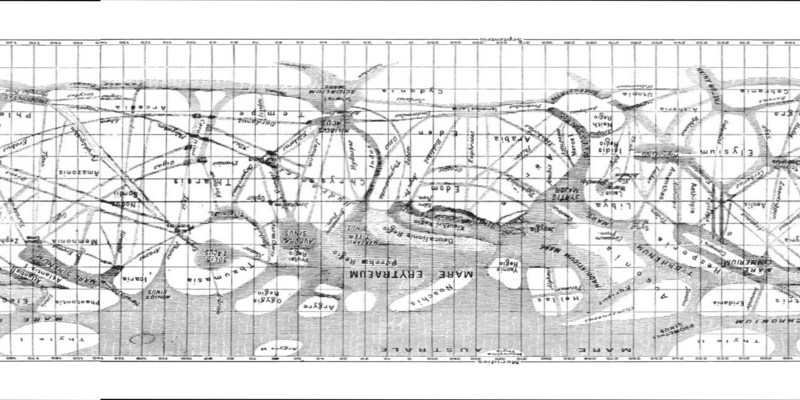 The map's longitude was aligned with the standard map using the dot that seems to correspond to Olympus Mons. 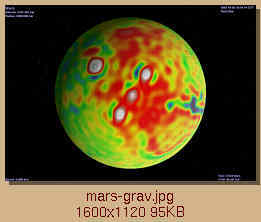 Note, however, that dots which correspond to Pavonis Mons and Arsia Mons are drawn somewhat to the southwest of their correct locations. 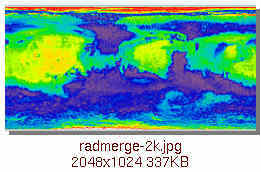 The resolution has been increased from 1Kx512 to 2Kx1K. 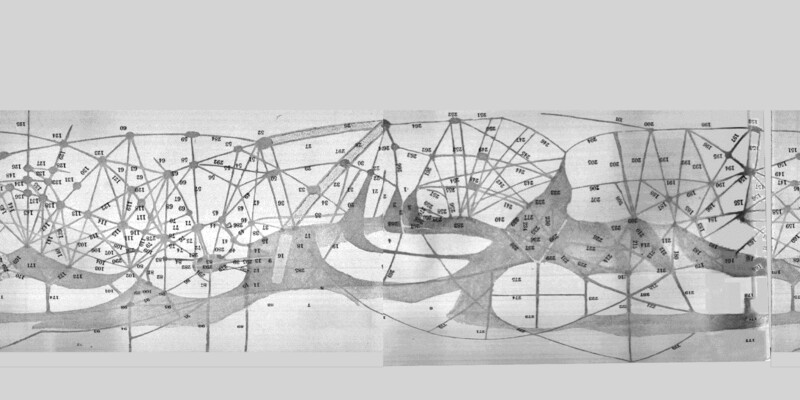 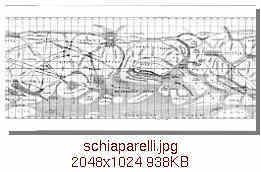 Map of Mars as drawn by Giovanni Schiaparelli. This surface texture image was created by scaling and rotating a picture of a map of Mars drawn by Giovanni Schiaparelli in 1886. 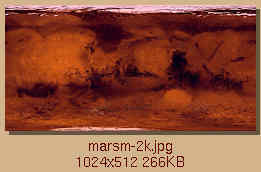 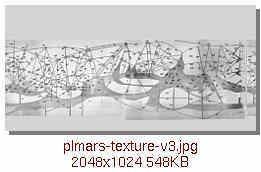 The original JPEG is available on the Web at http://history.nasa.gov/SP-4212/p6.html NASA images are public domain and they claim to have taken it from the article "Flammarion, La Planhte Mars" which originally was published in 1888.
plmars-texture-v3.jpg This texture was created by joining GIFs of Percival Lowell's sketches of the canals of Mars. 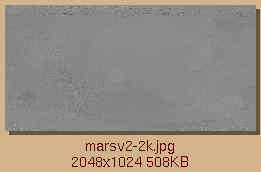 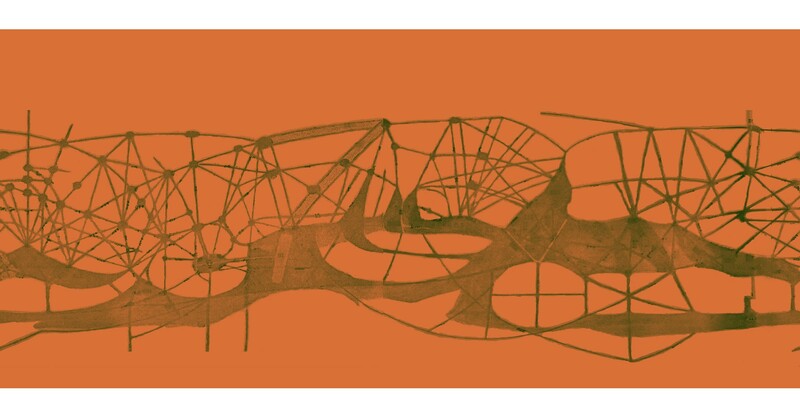 The GIFs are available on the Web in the appendix of the electronic edition of the book MARS by Percival Lowell, 1895.
plmars2-texture-v3.jpg This texture was created from the image shown above using ImageMagick, NetPBM, Painter Classic and a Wacom drawing tablet. 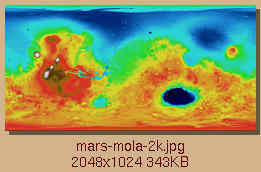 For more information about the results from the Laser Altimeter mission, please visit http://svs.gsfc.nasa.gov/stories/MOLA/ The textures below were generated by croping and scaling images provided on the Web by NASA. 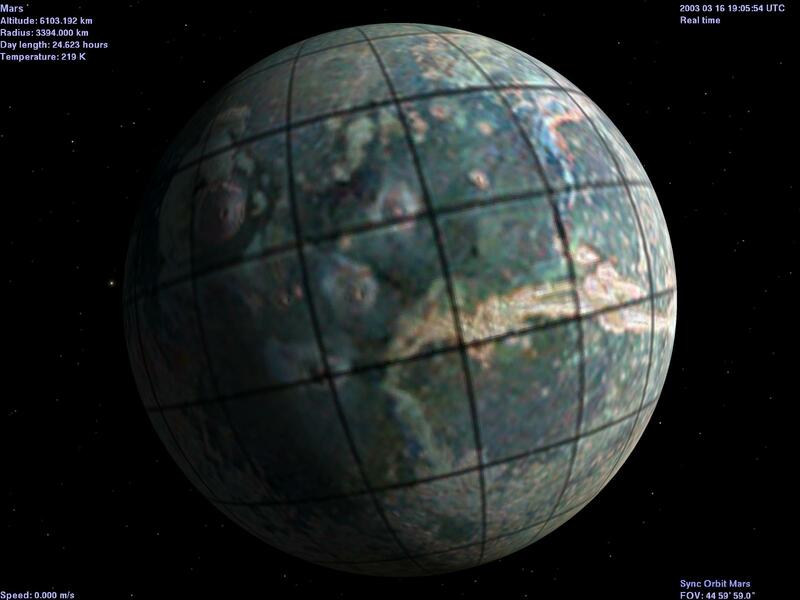 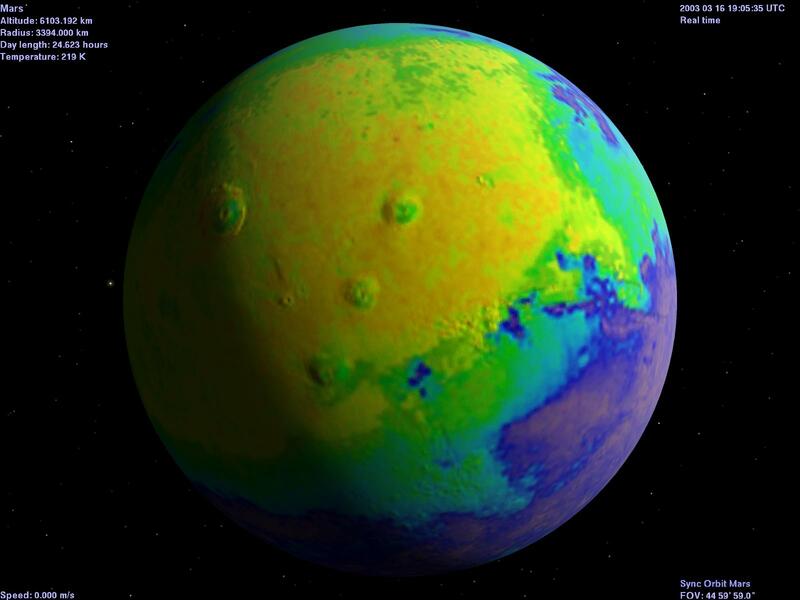 The original TIFF format maps were the result of work by NASA - Goddard Space Flight Center, Scientific Visualization Studio, Television Production NASA-TV/GSFC, and The MOLA Instrument and Science Team. 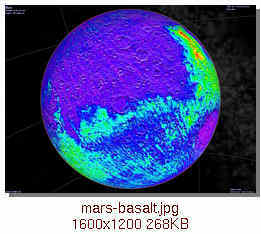 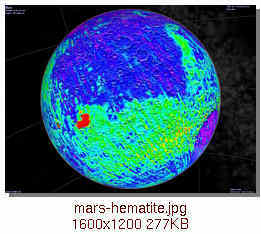 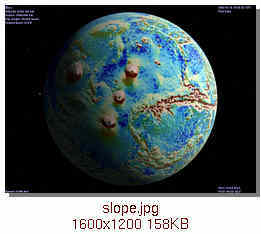 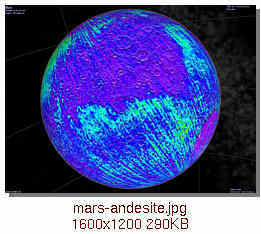 mars-mola-2k.jpg Blue areas are lowlands. 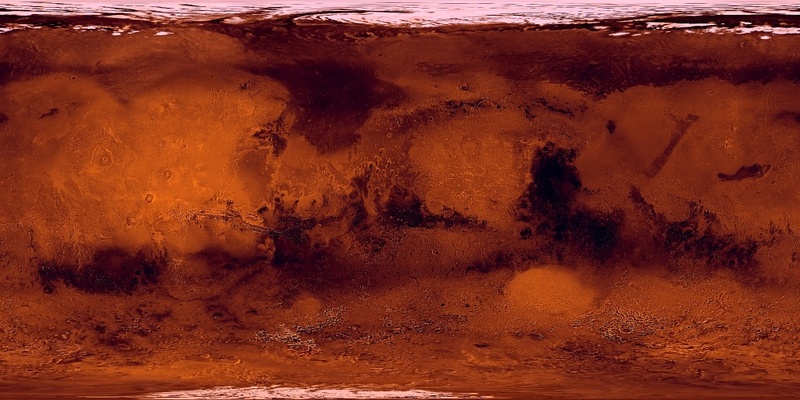 Highlands are mostly red. 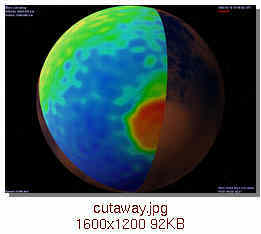 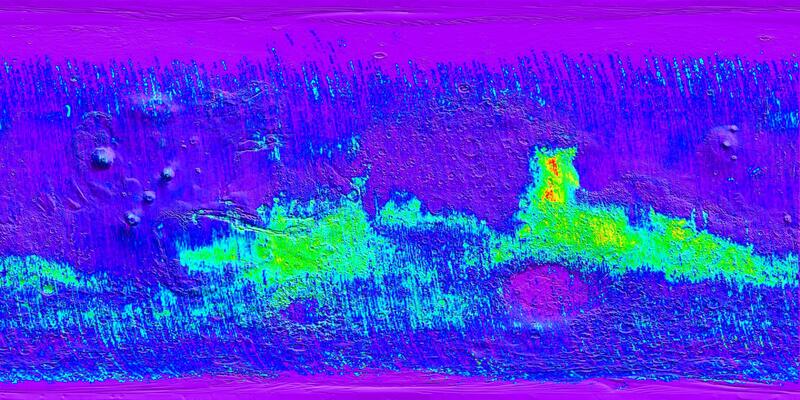 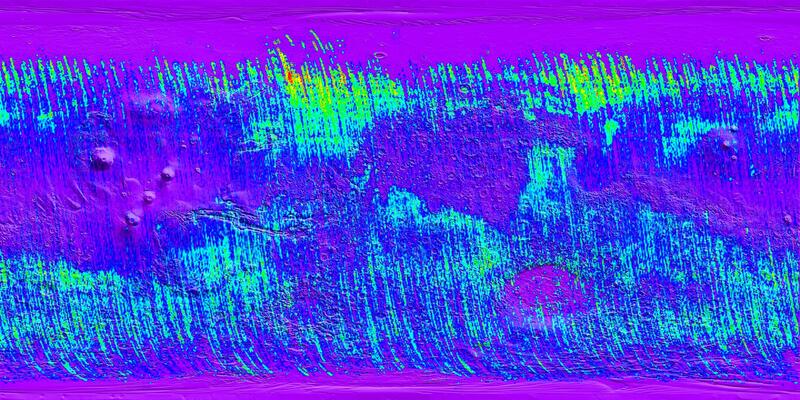 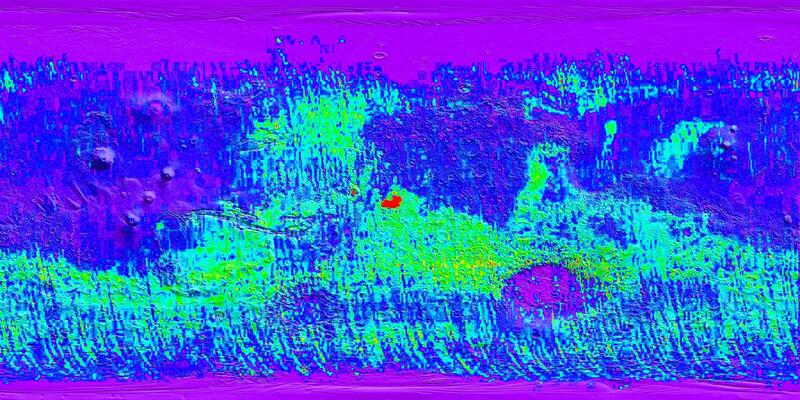 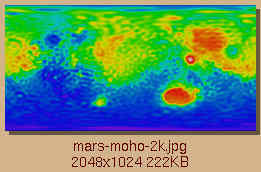 mars-moho-2k.jpg An indication of mantle thickness. 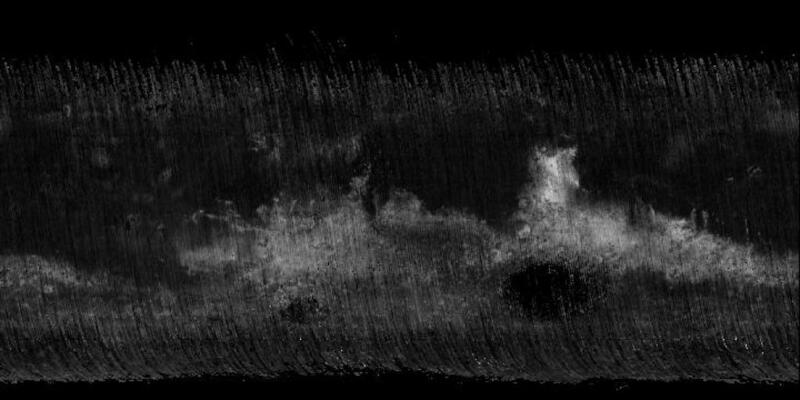 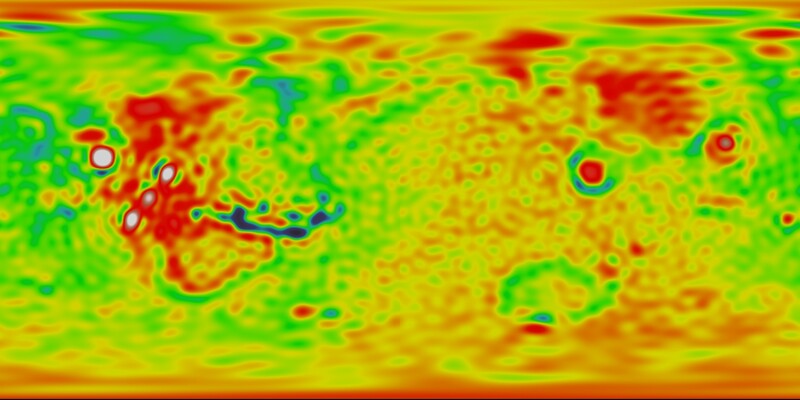 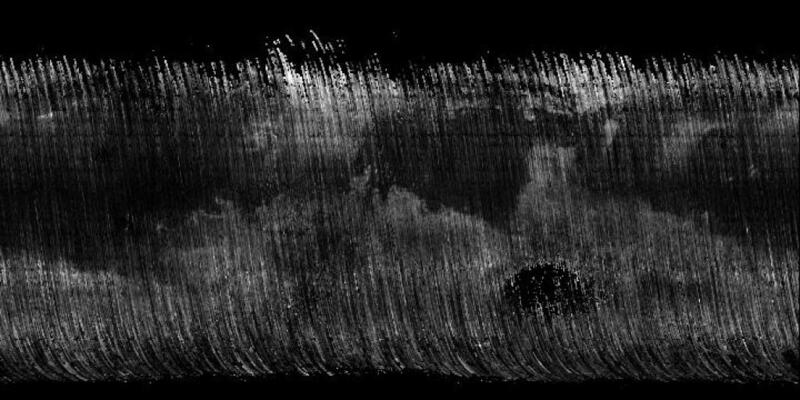 When this file is used as a CloudMap, its alpha-channel transparency will reveal part of the underlying surface Texture map. 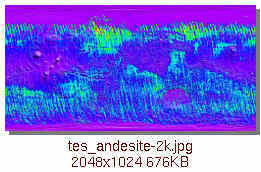 An indication of mantle thickness shown under a standard surface texture. 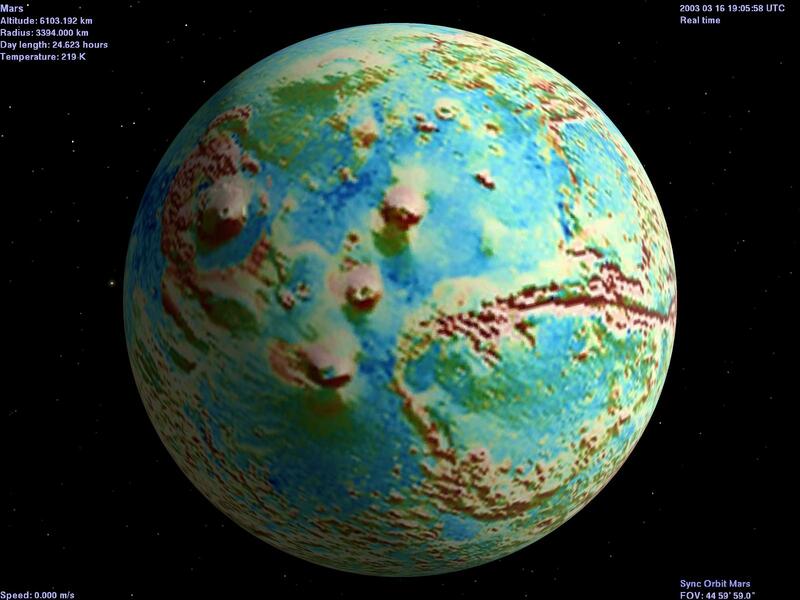 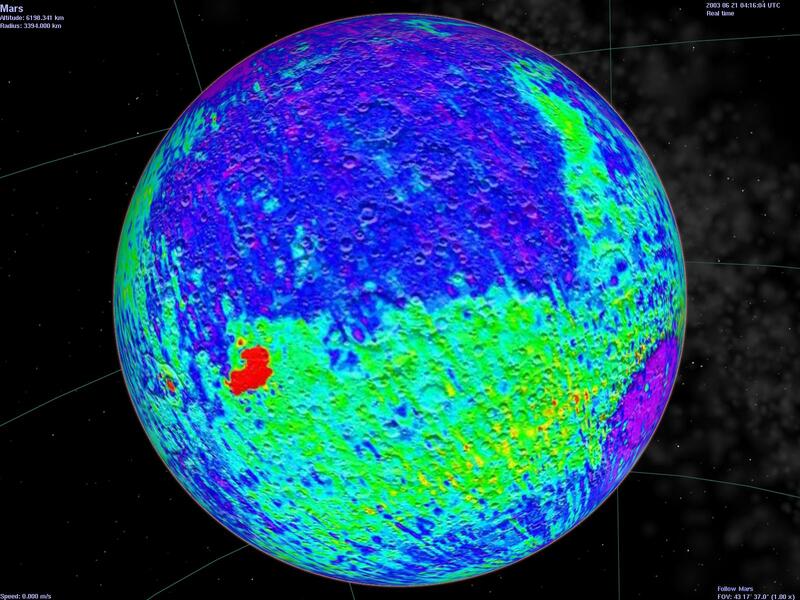 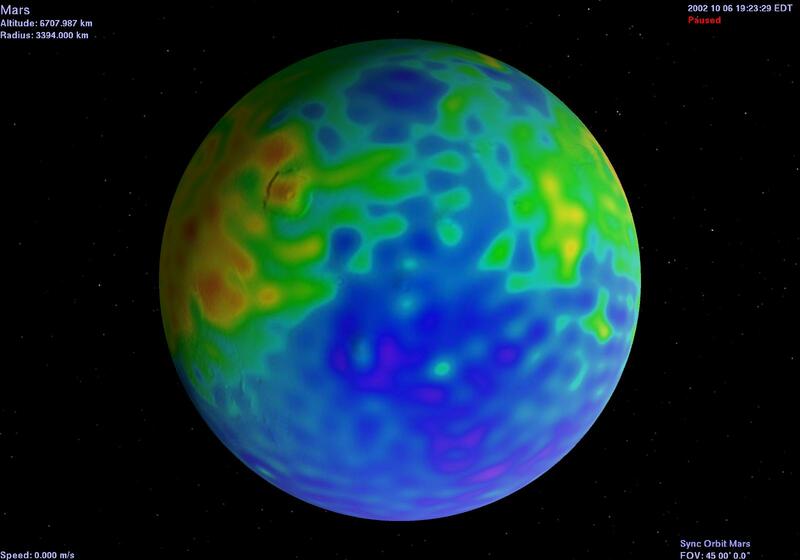 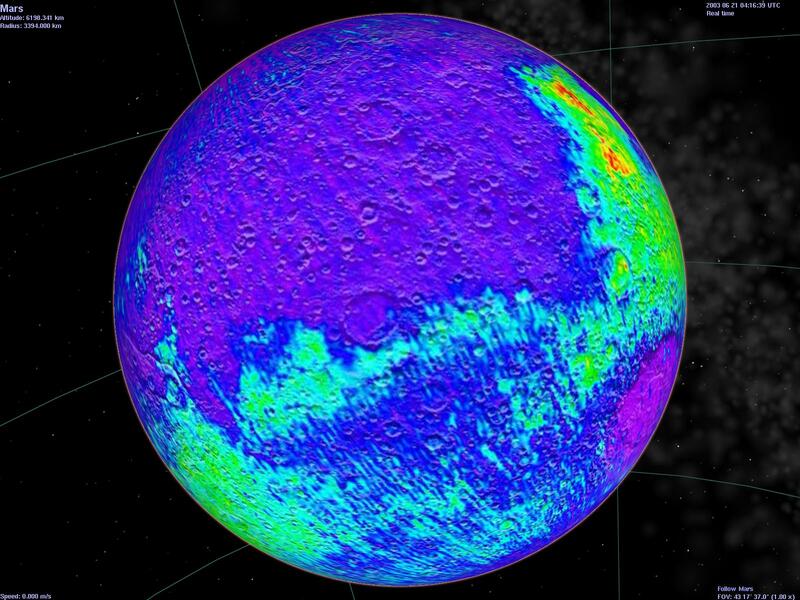 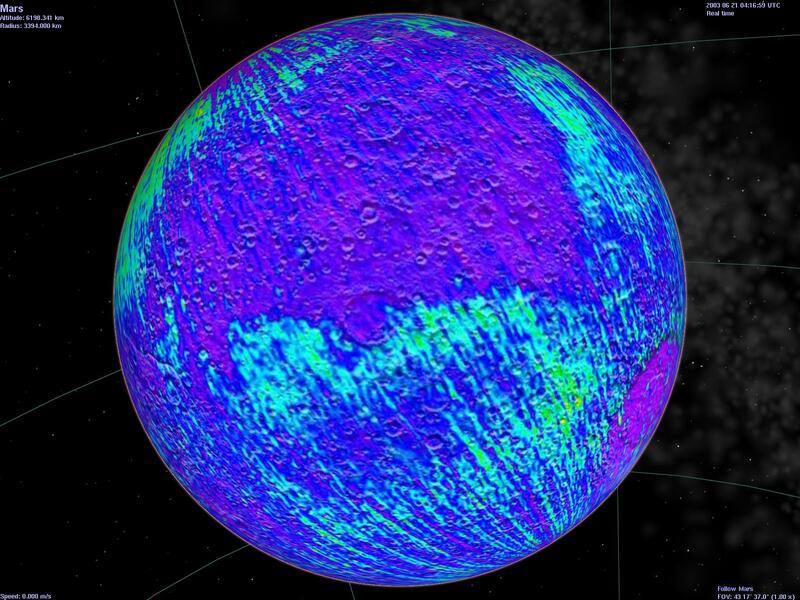 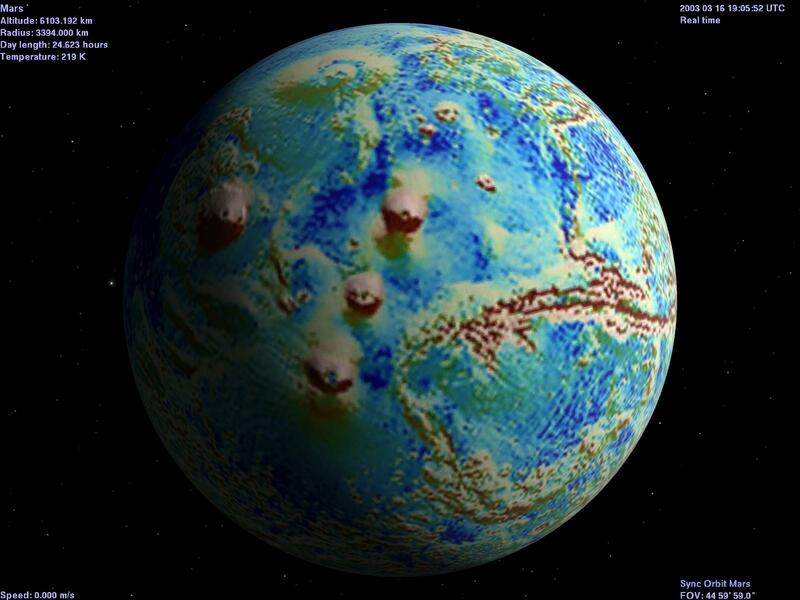 Note: NASA overlayed the maps below by a grey-scale shaded relief map. 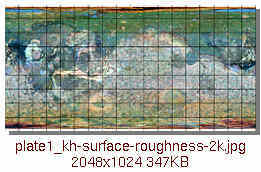 med_sl_rough_35_s-2k.jpg An indication of surface roughness. 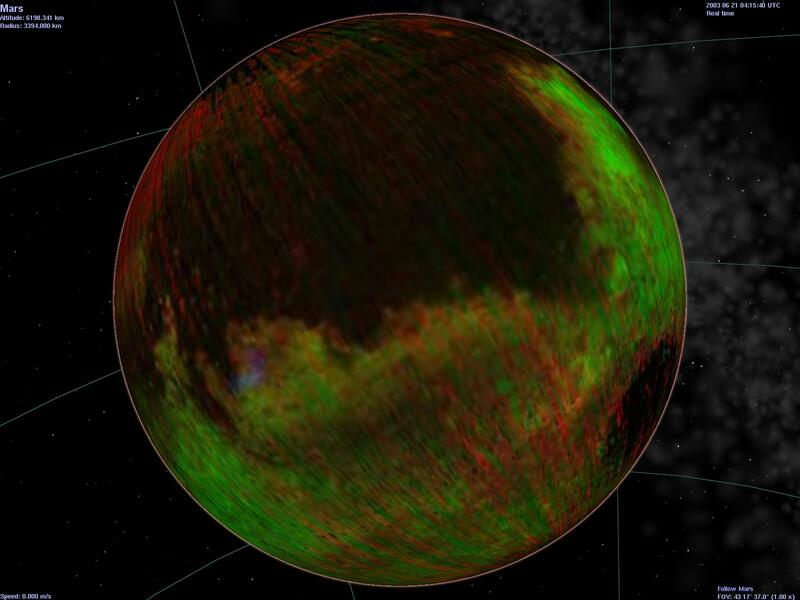 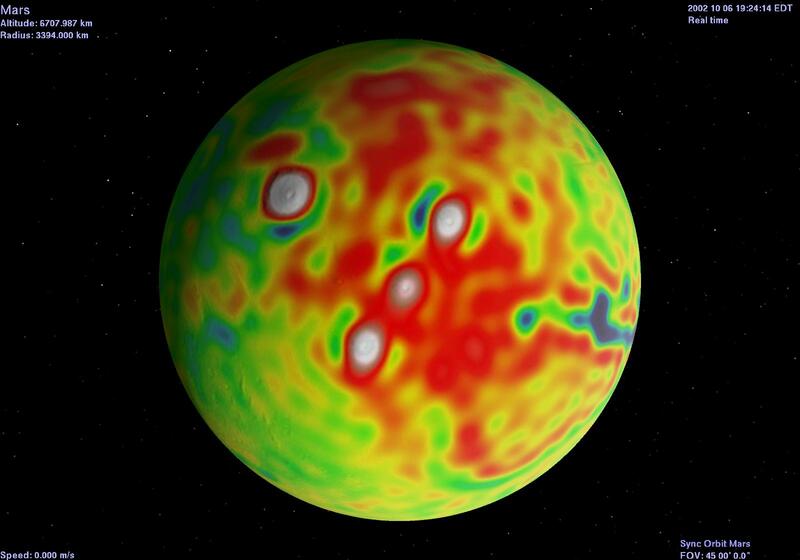 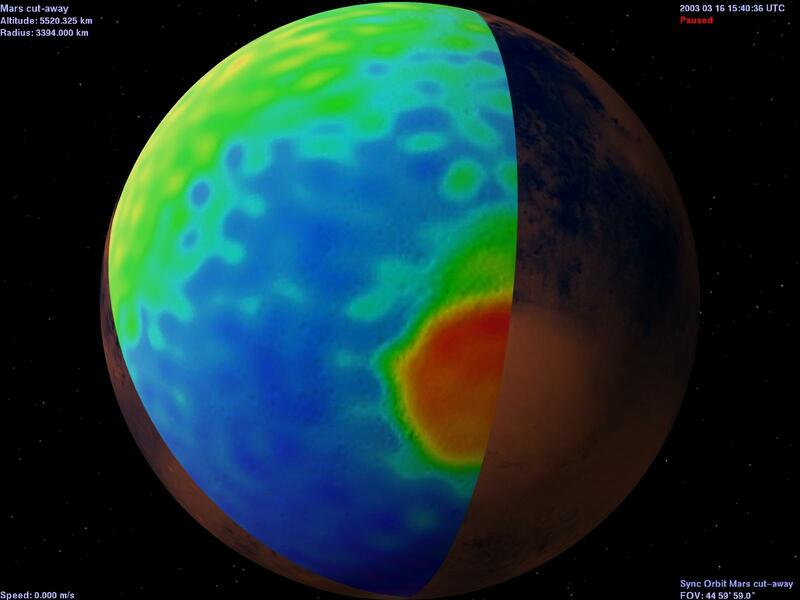 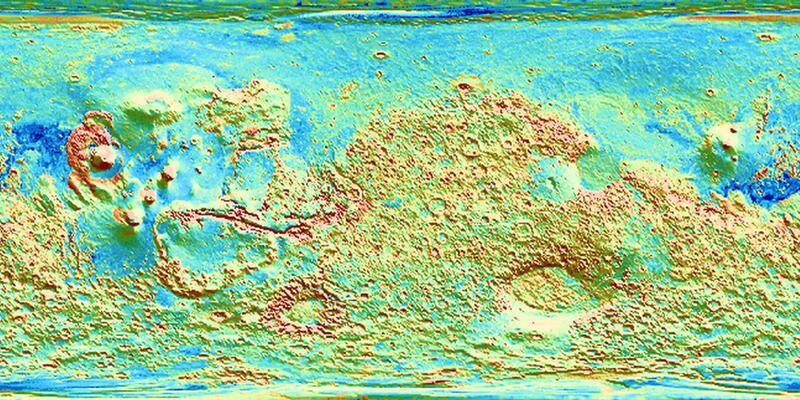 The data for these maps originate with the Mars Global Surveyor Thermal Emission Spectrometer group in the Department of Geological Sciences at Arizona State University. 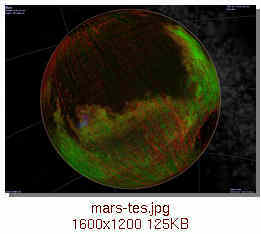 Full references for the original TES maps are at http://marsoweb.nas.nasa.gov/landingsites/mer2003/notes/tes_mineral.html. 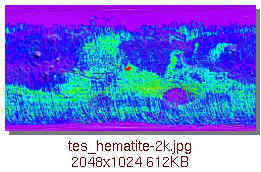 Grey hematite surface map A type of mineral usually created from reactions with water. 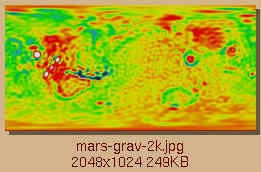 The 2048X1024 textures below were generated by slightly scaling down 6 pixel/degree "simple cylindrical projection" maps generated on the Web by the USGS "PDS MAP-A-PLANET" site at http://pdsmaps.wr.usgs.gov/maps.html The resulting images and texture maps below are abnormally smooth because of the subsampling done by the PDS site when generating the relatively low resolution images. 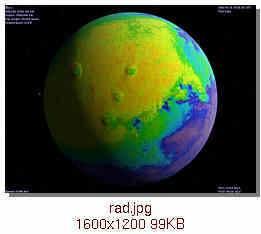 This Zip archive collects all of the maps above other than the Viking images and bumpmaps. 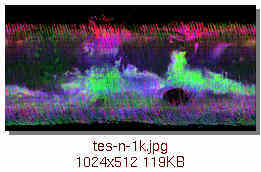 Appropriate versions of the latter are included with Celestia. 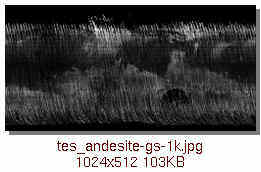 It also includes the AltSurface SSC file described below, along with a link to this Web page. 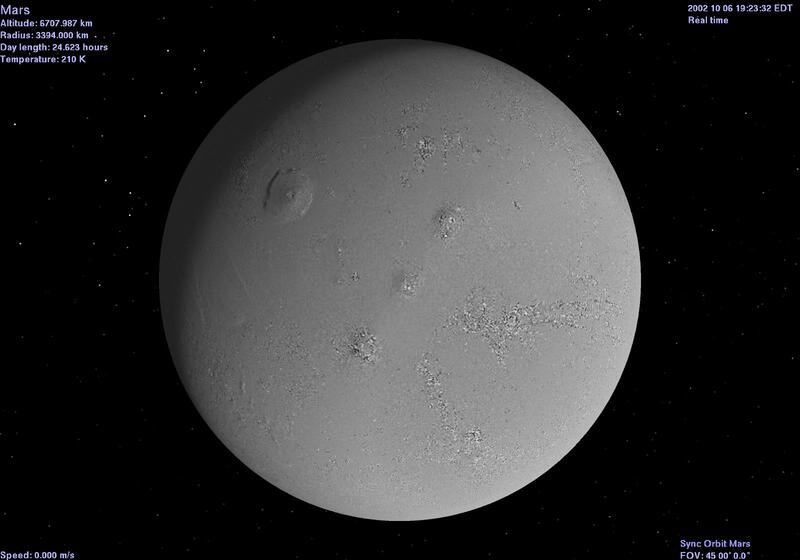 Starting with v1.3.1pre4, Celestia supports the use of Alternate Surface Textures. 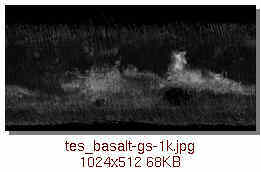 In a .SSC file, you can provide a list of textures associated with an object. 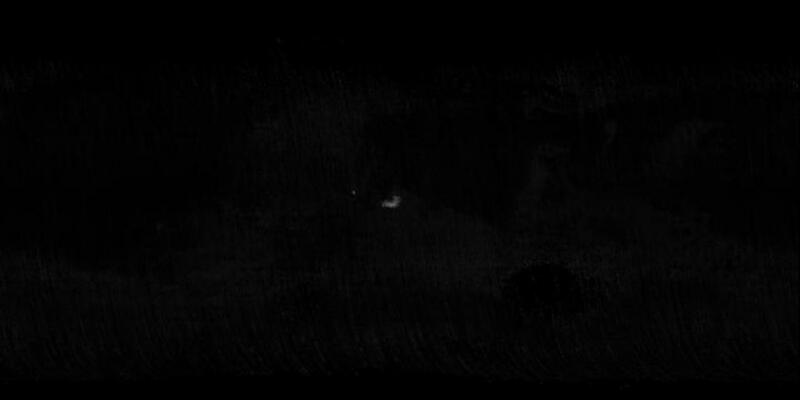 Then when Celestia runs, you can choose the appropriate texture by Selecting the object and then using the "right-mouse-button-context-menu" ("ctrl-click" on a Mac). 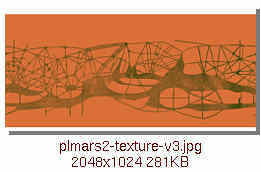 It will show the menu item "Alternate Textures" whenever there are alternate textures associated with the Selected object. Alternate textures can include all of the qualities associated with surface textures traditionally used for Celestia's objects, including bumpmaps. 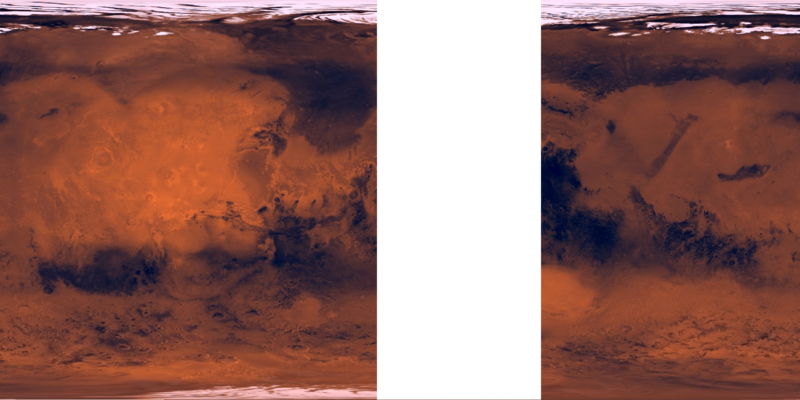 Atmospheric effects with clouds are not available, since they're associated with the object itself, not with its surface texture. 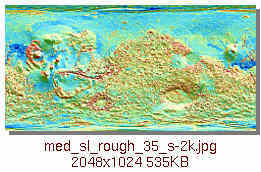 Here's an example .SSC file listing many of the maps of Mars that are available on this page.